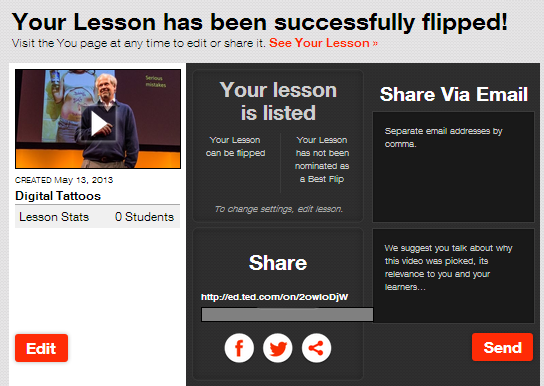 Below is a visual guide to walk you through the process of how to created a flipped lesson using TED Ed website. 1- Click on " Find and Flip "
You can search YouTube for a video to build a lesson around. This video will be the centerpiece of your lesson. 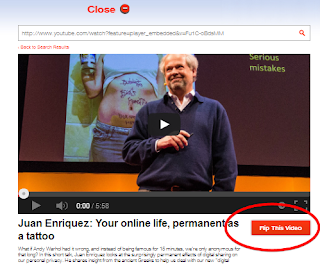 3- Click to select that video then click on " Flip this video "
Clicking on "Think" button enables you to add questions around on the video. The questions can be either multiple choice or open answer or both. Provide more insight or questions to get students thinking deeper. Within a limit of 250 characters , you add more food for thought to your students around the video they have watched. When you share your video lessons with students, they will be to watch the video then engage with the content and questions you provided on it. All they have to do is click on each category : Think, Dig Deeper, Discussion, and Finally ) to get started . 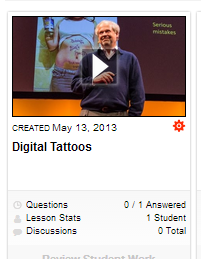 You will be able to track how many students answered the questions and how many discussions are created and all the other stats about your lesson right from your TED ED account.